Thanks for visiting the Media Resources page for the book Small Business, BIG Vision: Lessons on How to Dominate Your Market from Self-Made Entrepreneurs Who Did it Right. We know you’re busy, so we’ll get right to it. We’d love for you to write about the book in an article or blog post. Below are some resources to make it a breeze to do just that! If there’s something missing, just let us know, and we’ll be happy to accommodate in any way we can. Matthew and Adam Toren are brothers, serial entrepreneurs, investors, and mentors. For nearly 20 years, Matthew and Adam have provided instruction in management concepts, marketing, and finance to emerging and distressed small businesses. They currently own and operate a successful media company, which includes several online properties and print publications. The Toren Brothers are also the authors of the award-winning book, Kidpreneurs: Basic Principles of Entrepreneurship for Kids aged 6 to12 years old and founders of YoungEntrepreneur.com, one of the largest online entrepreneur communities, and a must-visit resource for all startup CEOs, founders, aspiring entrepreneurs, mentors, and investors. In the world of entrepreneurship, your vision solidifies your resolve when things get tough, and it reminds you why you went into business in the first place. Authors, brothers, and serial entrepreneurs, Matthew and Adam Toren have compiled a wealth of valuable information on the passionate and pragmatic realities of starting your own business. They’ve also gathered insights from some of the world’s most successful entrepreneurs. This book delivers the information that both established and budding entrepreneurs need, explains how to implement that information, and validates each lesson with real-world examples. Small Business, BIG Vision proves that with a flexible mindset, practical skills, and the passion to keep pushing forward, entrepreneurs can find success, even in today’s ever-changing business landscape. To an entrepreneur, vision may very well be the most important ingredient to success. Without it, goals can’t be set, and there is no focus or reason for driving more and trying harder. This chapter discusses the importance of having a BIG Vision, where that vision comes from, where it can take you, and how to maintain it while remaining flexible and nimble in your business. Does every business need a business plan? Every business needs planning, but the type of plan required to achieve success depends on the needs and goals of the entrepreneur and his or her company. Chapter 2 details how to determine the kind of plan needed, how to create the right plan, and what to do with your plan once it’s in place. 3. Investors out – Collaborators in! Is finding and wooing investors a necessary part of every company’s progression? Not necessarily. This chapter helps entrepreneurs determine if and when they need to search for outside funding, and then discusses in detail the options for achieving business success without investors. For companies that need to bring on outside capital, the chapter also reveals what to look for in an investor and how to make them collaborators in your venture. Not all businesses need to bring on employees right away, and many never need to hire a single employee. The fourth chapter of Small Business, BIG Vision explores the ups and downs of hiring employees and the alternatives that exist for today’s entrepreneurs. Social media marketing can be a highly effective method of marketing just about any business – when it’s done right. It can be difficult to know the “right” way to take full advantage of social media’s effectiveness though. Regardless of their business model, Chapter 5 guides entrepreneurs though the often confusing world of social media and helps them to harness the power of this amazing business tool, by providing a detailed action plan designed to maximize their social media efforts. Why simply run your business when you have the ability to be seen as an industry leader? That’s the question posed by this chapter. When an entrepreneur uses his or her knowledge and experience to elevate themselves to “Expert Status,” it opens up a whole new world of possibilities and opportunities. Learn, step-by-step, to present and promote yourself as the expert you are, and how to use that expertise to explode your business. One of the joys of entrepreneurship is having the ability to make the world a better place. The seventh chapter of Small Business, BIG Vision explains the benefits of having a “big picture” view of the world, and it gives the reader ideas for making a difference through social entrepreneurship. Entrepreneurship comes with a risk of failure. In fact, having the courage to face that risk is one thing that sets entrepreneurs apart from everyone else. So what does a business owner do when the risk becomes a reality and they are on the verge of failure? In Chapter 8, entrepreneurs are introduced to concepts that have saved numerous companies from the brink of disaster. It isn’t ever easy to turn a business around, but it can very often be accomplished when the right formula is followed. 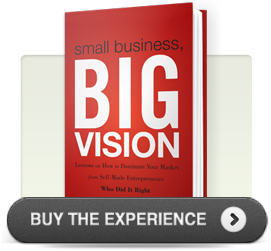 Who Should Read Small Business, BIG Vision? Startup Entrepreneurs: For anyone just getting started in business or launching a new company, Small Business, BIG Vision offers sound advice to get started right and stay on the right path – the one that will lead you to your BIG Vision. From initial planning through marketing, the book provides clear, actionable advice to get a business off the ground and help it thrive. Seasoned Entrepreneurs: Business owners who are beyond the startup stage will benefit greatly from the content presented in Small Business, BIG Vision. Wherever you are in your entrepreneurial journey, the book details how to take your business to the next level. Practical advice and instruction is provided on using cutting edge marketing strategies, effective collaborations, outsourced services, and proven planning techniques to catapult your business to new heights. Struggling Business Owners: Not all entrepreneurs are living out their entrepreneurial dreams these days. In fact, many are fighting for survival. With a renewal of their entrepreneurial vision, effective planning and marketing methods, and sound, tested guidance on achieving a business turnaround, Small Business, BIG Vision could be exactly what a distressed business owner needs to reinvigorate their spirit and their company!